The progress in my bathroom has been going in starts and stops. The whole past week has been spent on tiling, but they have to stop for a whole day between different sections to let the mortar dry. 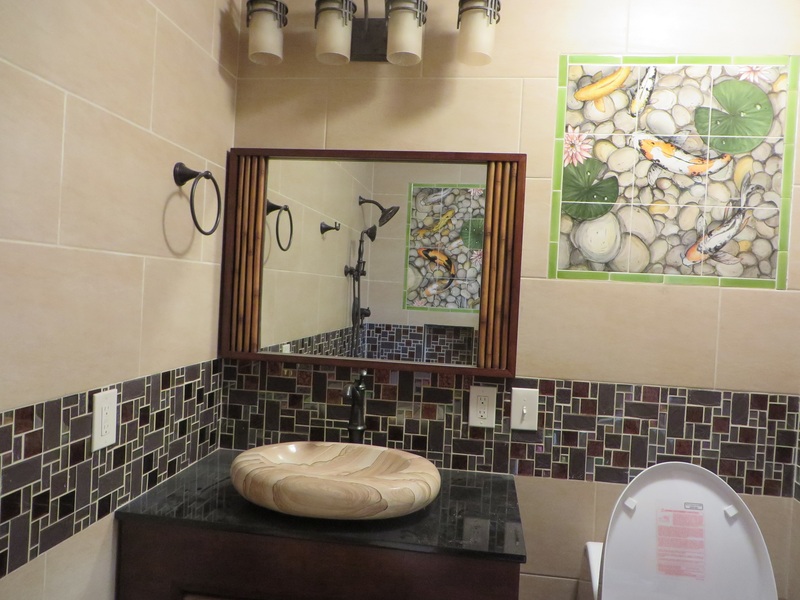 It is nearly done, though, with just a couple of small sections of decorative tile remaining to finish before the grouting can begin. My garden is doing great. The beans and corn have sprouted, which is nice to see. My irises are in full bloom. This past weekend I planted out the squash, cucumbers, and cabbage. I also trimmed back my stand of bamboo, which had grown to envelop my camellia bushes, and my dad spent a whole day digging up the root masses to get it back under control. I checked on the bees, and they look like they are settling in well. 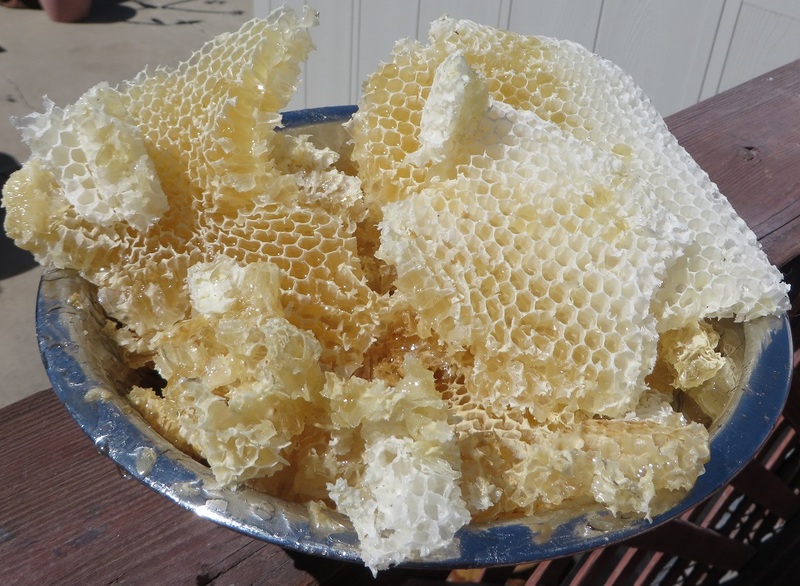 There is lots of activity around the hive, so they seem to be going strong. 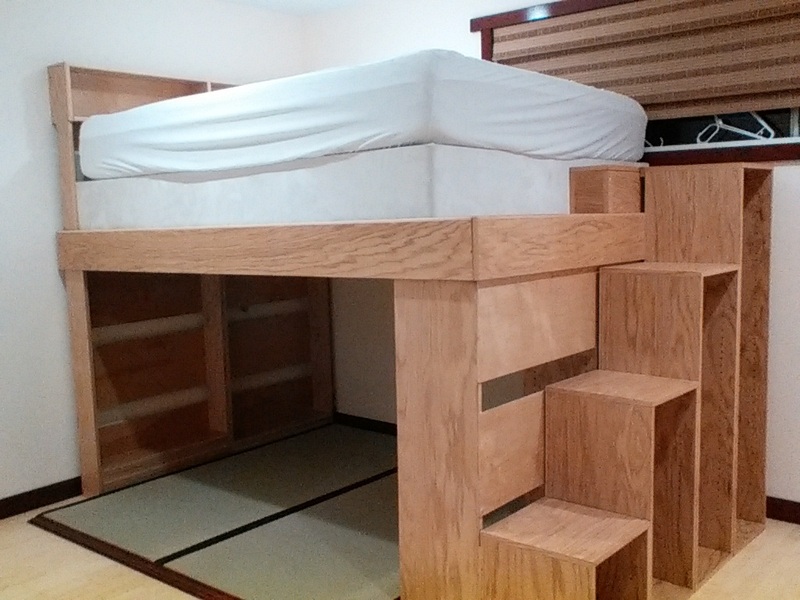 My parents had originally planned to have returned home by now to get back in time for babysitting duties, but they were notified that they don't have to do the babysitting anymore, so they are able to stay longer to see the conclusion of the work on my bedroom. 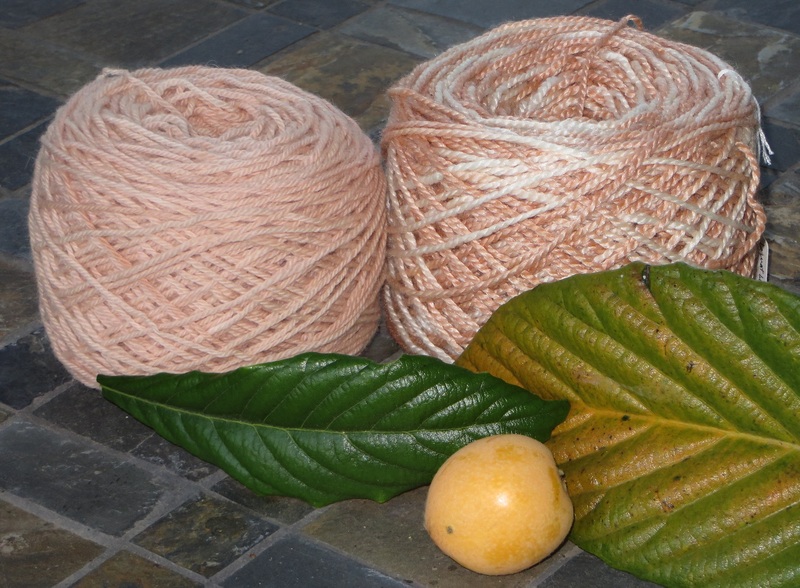 I have recently started combining my gardening and crocheting hobbies by making forays into the realm of natural plant dyeing. At the moment, I've mainly just been studying books on the subject and collecting various garden prunings for making dye. 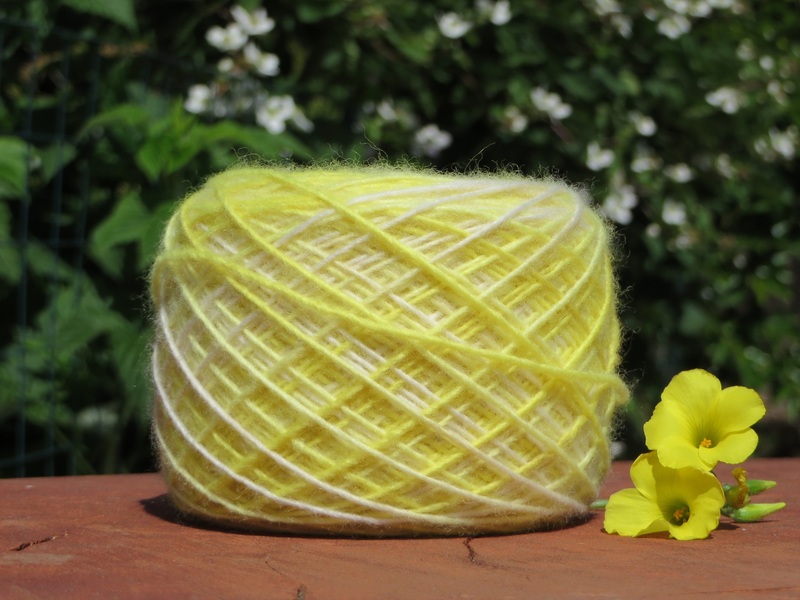 I haven't bought any yarn yet, mainly because I don't have anywhere to put it with all the renovation going on in my house. There is, however, a scheduled talk at a nursery in Richmond this coming Saturday, and I'm hoping to get a chance to attend. It's been awhile since I last updated, mainly because I was debating what course to take after the recent LJ Terms of Service update. I did make a journal copy over at Dreamwidth, but I didn't want to switch over there abruptly without warning. I decided that I would keep updating here just until I finished some dangling threads. Mainly, I'm thinking of my Germany trip report, which still has one more installment left. I plan to finish that after I get my bedroom set back together once my remodeling project is completed. I'll switch over to using my Dreamwidth account (same username) as soon as I post the last trip report. Last Saturday, April 8th, I went to San Francisco with megory. We shopped a bit at the farmer's market, picking up some cheese and flavored olive oils and pastries, then we hopped on a bus and headed over to Japantown to meet up with mangaroo for the cherry blossom festival. Thanks to the warmer weather this spring, the sakura trees were already mostly done blooming, but we still enjoyed wandering around the various vendor stalls. I hadn't intended to spend any money, but in the end I bought a number of items for decorating my bedroom. On Sunday, Jenn came over, and we all attended the Flower and Garden Show at the event center. It was about half the size of the events in previous years, which was somewhat disappointing. One of the vendors explained that, thanks to the heavy rains this winter, most of the landscaping companies who usually participate in the event had to pull out because they were too busy with a backlog of customers. She said they should have just reduced the ticket price to compensate; instead, the event organizers were dealing with angry calls all weekend from people who felt cheated. We still found plenty of things to buy, but most were items such as flavored balsamic vinegar and other non-garden-related products. This past Saturday, my dad took me out to pick up a new batch of bees. This time I got a nucleus (essentially a miniature, functioning hive) instead of a package. I'm hoping they will get off to a stronger start than the ones last year. After that, I planted all my corn and beans. This year I'll have 24 different types of beans in my variety trial. The back yard is looking quite nice. The apple and cherry trees are blooming, as is the wisteria and the peony. The grape vines are starting to sprawl everywhere, and the surviving peas are about to put out flowers. The blackberries and raspberries are showing signs of having a heavy crop this year, and there are tons of baby plums on my Santa Rosa tree. Nothing on the apricot this year, but the quince looks like it might produce at least a few fruit. I've already gotten a few handfuls of blueberries. The bathroom project has been making more progress, though there was about a week delay as my parents hired the workers to replace all the pipe for my whole house, both water and gas lines. It seems the wrong type of metal had been used in places, and there was corrosion everywhere. 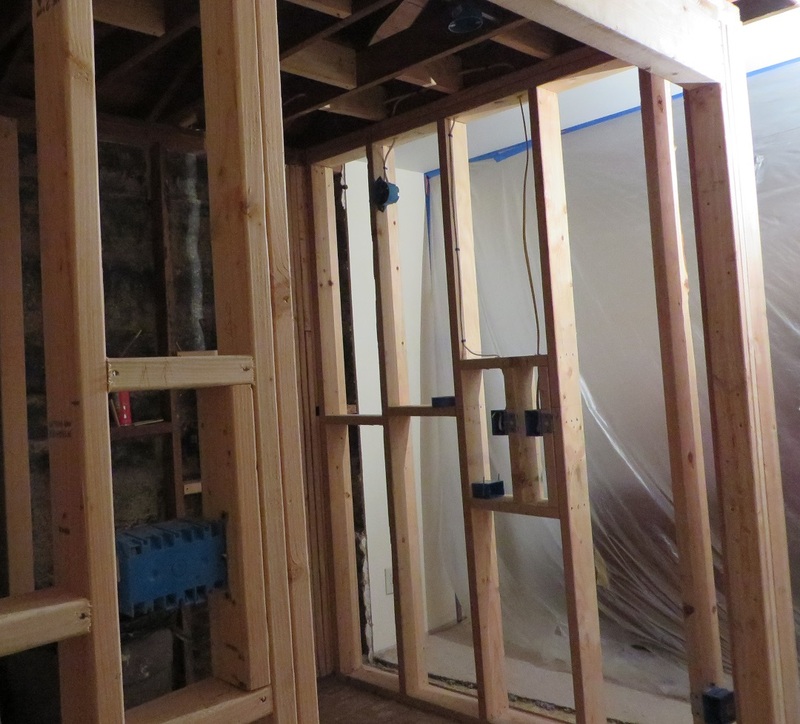 The bathroom is back on track now, and the workers are finishing up the drywall. They should start installing tile tomorrow. It's actually looking more or less like a bathroom now. This past weekend, I accompanied my parents to Long Beach for a cousin's wedding. We arrived Wednesday afternoon and had time to walk around for a few hours to see the area around the hotel. We visited the Aquarium of the Pacific, which isn't as extensive as the aquarium at Monterey, but it did have some interesting exhibits. The next day, we set out exploring in the morning and came across the commuter train. We saw that it went straight to Los Angeles for a ridiculously low price, so we all hopped on board for some sightseeing. 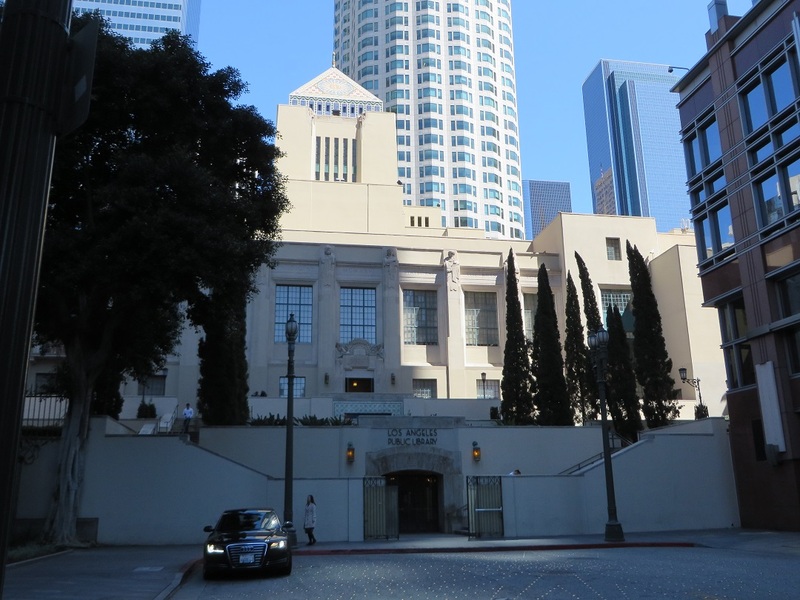 After getting off the train at the final stop, we wandered over to the Los Angeles Public Library, which has some decorative architecture. On the other side of the library, we found a tourist information booth with a helpful attendant who provided us with a map and circled items of interest that we could enter for free. We had an excellent lunch of vegan ramen and then entered City Hall to catch the view from its observation deck. 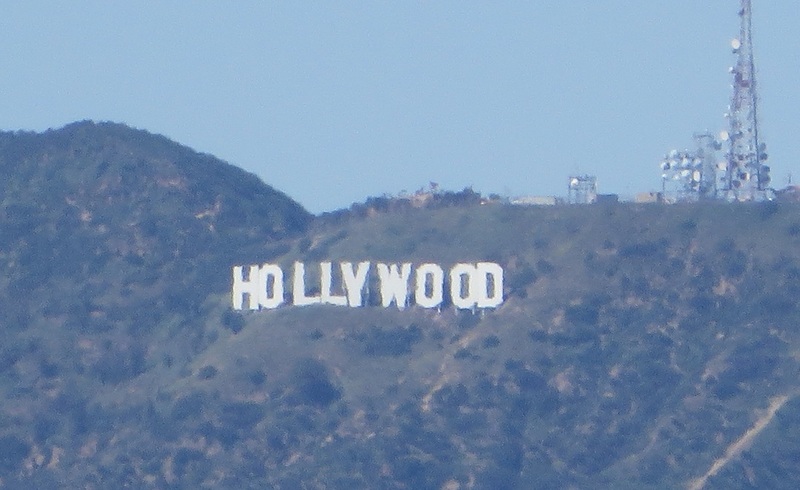 We could see the whole city, including the distant Hollywood sign. We continued walking around, also taking in the cathedral, noticing that the sidewalks were unusually empty. I had expected that it would be like any large city--Tokyo, Frankfurt, London, or even San Francisco--with crowds of people everywhere. In contrast, the sidewalks of Los Angeles had only the occasional passerby. The place we had eaten lunch was packed with people, but stepping outside was like returning to a small town. 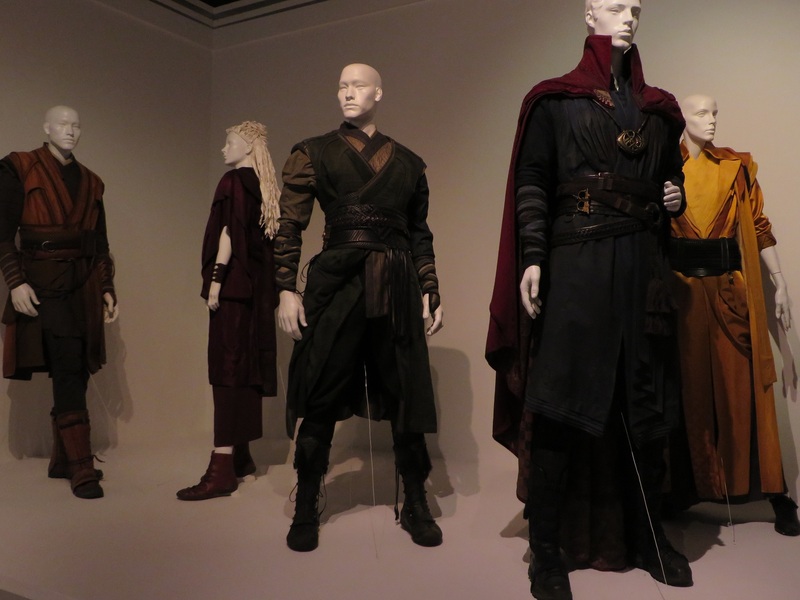 We ended up at the Fashion Institute of Design and Merchandising Museum, which had displays of costumes from the biggest hit movies of the past year, including Rogue One, Hidden Figures, Star Trek Beyond, Fantastic Beasts, and Doctor Strange. That was spectacular, and definitely my favorite part of the trip. Friday we had breakfast at a local cafe restaurant, then walked around downtown Long Beach. In the afternoon we shopped at the nearby Shoreline Village, a cluster of shops somewhat like San Francisco's Pier 39, and walked along the water to see the Queen Mary and other ships from afar. We finished off the evening by attending the wedding rehearsal dinner. Saturday we spent the morning walking along the beach before having lunch at a local mead shop. Despite the early hour, the place was packed with people for a mead tasting event. We attended the wedding in the evening, which was held at a local restaurant. Then we had to leave early the next morning for our return flight. Work has been progressing on my bathroom project. I'm being kept busy running around ordering and picking up various materials. 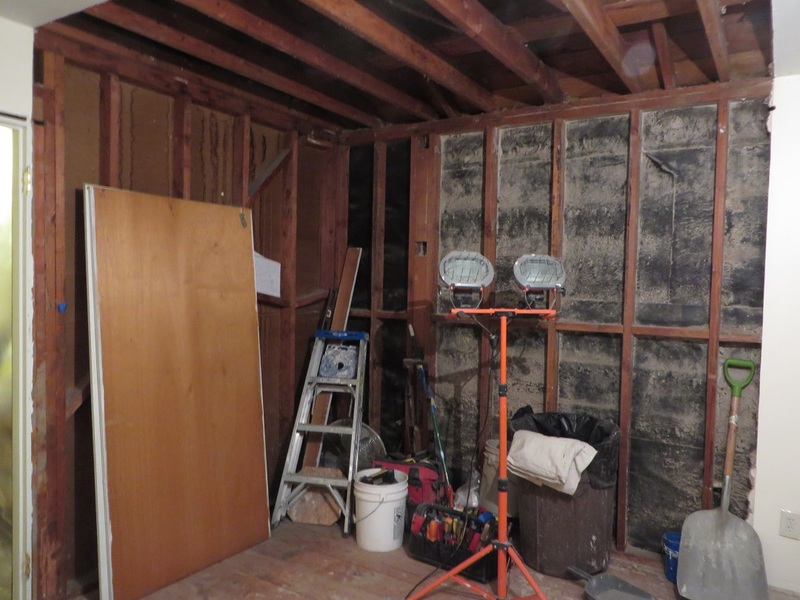 The new room has wall studs and electrical. It should be ready for the rough-in inspection soon, once the plumbing is in place. Sunday I planted all of my recent nursery purchases. I also got the seeds planted for my summer vegetable crops. A few of my fruit trees are beginning to flower now that the weather is warming slightly, and the asparagus is just starting to sprout. Monday I went to a bath supply store to order a sink and other fixtures for my bathroom remodel project. It took nearly an hour to find a faucet that fit the design and came in a single-hole vessel sink model with a finish of the right color. It's rather frustrating how narrow that category is. I would find a good design, but then discover it didn't come tall enough for a vessel sink. I'd find a vessel sink faucet, but then learn it only came in a three-hole model. Or I'd find one the right design and model, only to be told it was available solely in chrome. In the end, I wound up picking a shower head and then back-tracking to get the faucet that matched it (which the shop didn't have on display and had to look up online). 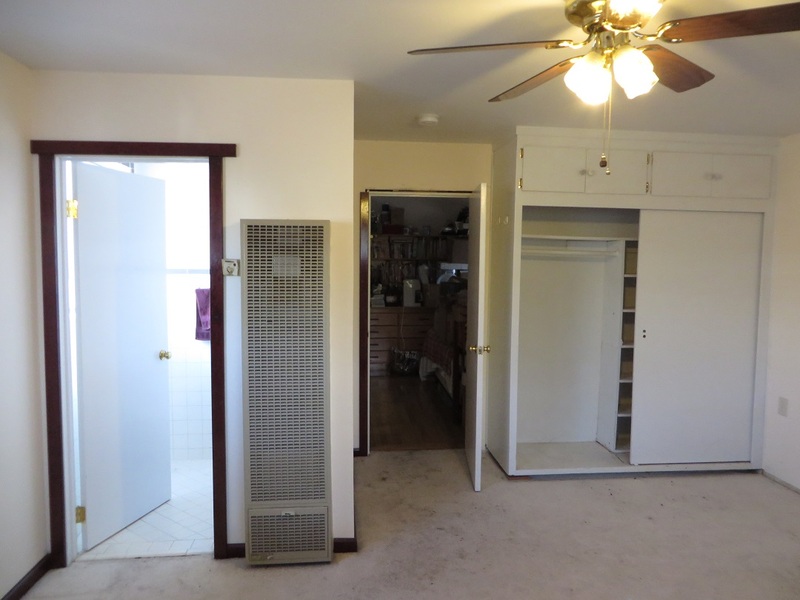 I did run into a setback when the plumber recommended by the contractor I'm considering declined the job because it's too large; I guess he only does minor repair work and not full remodels. I'm going to have to wait until next weekend to have more people look at the project and give me estimates. 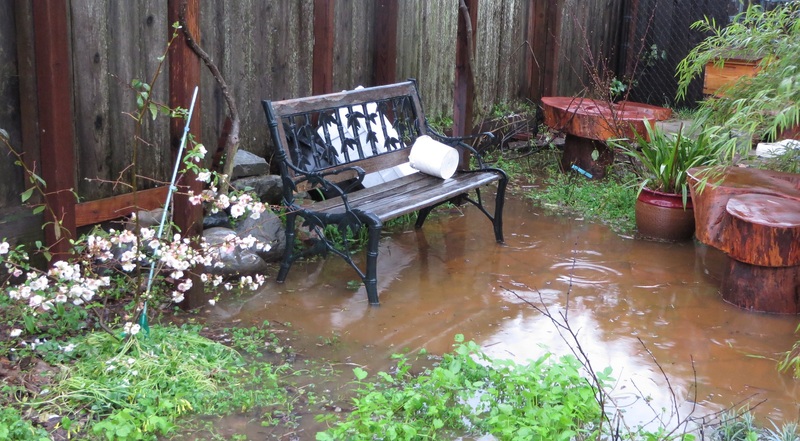 The rain has been pretty heavy this past week. The most recent storm turned most of my back yard into a swamp. This makes for a lot of muddy doggy footprints on my floor. I went to my local nursery a couple weeks ago and asked if they carried any dwarf avocado trees. The staff had never heard of such a thing. I went back this weekend, and they had gotten a bunch in stock. They must have looked them up and ordered them after my previous visit. 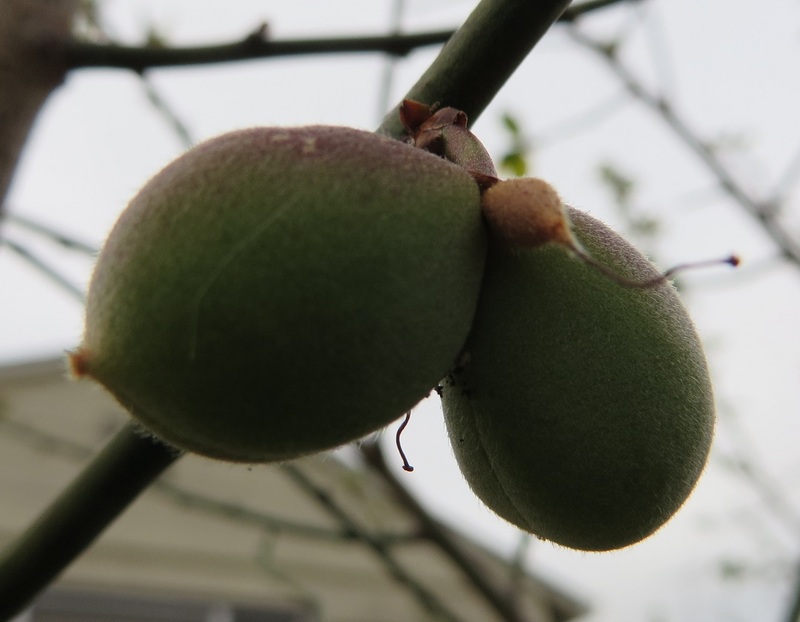 I picked up one of those, plus a 4-in-1 grafted almond tree to try out in my yard. Next weekend I'll start the seeds for my summer transplantable crops, mainly squash and cucumber. Another promising piece of news is that I may have found a contractor to do my bathroom renovation project. He's a friend of one of my neighbors. He responded quickly when I called and returned a reasonable estimate. I just have to get a good estimate from his plumber, and I should be all set. If I'm lucky, the project could get started next month.